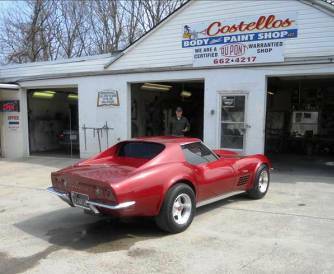 ​Costello's Body & Paint Shop, was established in 1961 by Mr. Edward Costello. Mr. Costello built and grew his business by offering reliable service to his customers and providing quality work at a reasonable price. For over 50 years, customers have come to rely on the Costello name brand for all of their collision repair and auto refinish needs. In March 2000, Mr. Costello retired and passed the business on to Mr. Jeff Sweeney. Jeff and his team of professionals continue to uphold Mr. Costello's promise of providing quality work, reliable customer service, and following the Biblical principle of "Doing unto others as you would have them do unto you." (Luke 6:31) Costello's Body & Paint Shop continues to be widely known for its quality service and repairs. Customers maintain their loyalty and trust in Costello's by returning time and time again. We would be honored to serve you the next time you are in need of a collision repair facility.